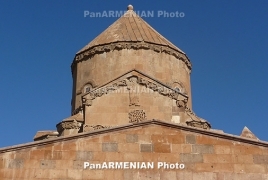 PanARMENIAN.Net - Armenians can once again practice their faith at the Armenian Cathedral of the Holy Cross located at the Akhtamar Island in Lake Van, in eastern Turkey, TRT World reports. The site has been a holy site for Orthodox Christians for more than 1,000 years and Armenian Orthodox Christians haven't been able to worship there since 2015 due to what the government said an increase in activity by the PKK. The cathedral is considered one of the finest remaining examples of medieval Armenian architecture, with UNESCO adding it to its list of tentative World Heritage sites. But now, Armenian are able to the island for the annual service, a tradition which started eight years ago. They believe this house was built to house a piece of the cross that Jesus died on, Sarah Balter says in the story.